Many military families get to experience new tastes and flavors as they move all over the world. This week’s recipes take you on a trip around the world, from Mexican posole, to an Asian curry, to a spin on the American mac and cheese classic, all using one seasonal ingredient. Butternut squash is very versatile, making appearances in soups, dips, pasta dishes, and chili, just to name a few. Its bright-orange flesh adds welcome wintertime color to your plate. The most intimidating thing about this savory fruit is its thick skin. You need a sharp knife to get through it. Butternut squash keeps really well so you should be able to find it in your commissary most of the time, but its peak season is early fall to winter. 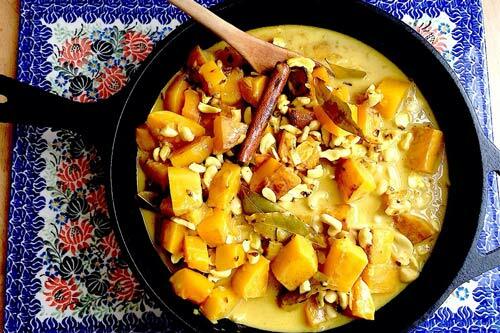 The butternut squash brings a unique sweetness to this subtly spicy stew. 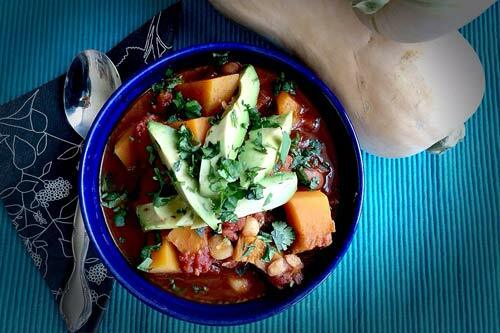 The dish uses many pantry items but the addition of the squash, avocado, and cilantro really brighten it up. If you want to use an oil less processed than canola, you could keep the temperature of the pan closer to medium and use olive oil, or for the suggested medium-high heat, you could substitute coconut oil. This curry was slightly sweet, not too spicy, and the cashews provided a really nice crunch. I served myself one portion over brown rice for lunch and then froze the rest for school lunches on days when I’m pressed for time. My daughter has a thermos that I send in her lunchbox so she can have a warm lunch during chilly days. I didn’t try to find an Indian market to track down the curry leaves, so I just used the dried bay leaves that are available at the commissary. I usually don’t like to choose light, or low-fat substitutions for foods because often all kinds of undesired ingredients get added in to make them taste good. Some brands of lite coconut milk (like Trader Joe’s) simply contain water and coconut milk, so this is a substitution I gladly made to save on calories in this recipe. Coconut oil is an obvious substitution here because it’s a coconut dish. My husband and I are lifelong vegetarians, and for the first 108 days of this year we’re challenging ourselves to make some big changes to the way we eat, in a grand experiment to see if we notice equally big changes in the way we look and feel. Being vegan is part of the change. Our daughter doesn’t particularly like this change and it’s not something we’re forcing on her. She can choose eggs and dairy when we go out, or she’ll get milk in the school cafeteria. But, if I’m cooking, it’s going to be vegan for now. When a yoga student heard what I was up to, she recommended the Oh She Glows blog. This recipe was one of the first that caught my eye because my daughter, like most 9-year-olds, LOVES mac and cheese. I knew better than to call it mac and cheese because I didn’t want to set unfair expectations for the dish, but in the end she said, “Mom, this doesn’t taste vegan!” Win for me. I added broccoli for a one-dish meal. You’ll probably have to go to a health food store, or well-stocked grocery store for the nutritional yeast. I have yet to find it in a commissary. You don’t want to leave it out. It’s what gives the sauce the cheesy consistency.